In Punta Cana snorkeling is our favorite water sport; we would rather do that than just about any other activity while on vacation. Every resort offers free snorkeling, they lend you equipment – you hop on an open boat that brings you straight out to the reef. This is an excellent way to get comfortable in the water and with the equipment, especially if you’re not very experienced. However, you will tire of this Punta Cana snorkeling excursion very quickly because: it is too crowded (everywhere you look you’ll have flippers in your face) and there isn’t much to look at (right in front of the resort isn’t generally a tropical aquarium). What we’ve often done is gone over and asked the locals soliciting customers for charter fishing (remember never to go fishing with these people – see my fishing page) to find someone to take us snorkeling. Usually for about $40 you can get somebody in a small open boat to take you to a section of reef with a deserted beach for a few hours. Often, you’ll luck out and get someone who knows snorkeling in Punta Cana and will swim with you. It’s amazing how much more you’ll see (and learn) with an experienced guide. Many a time, these guides have taught us how to find scallops or even how to spear-fish and catch octopus. A cheap Punta Cana snorkeling excursion like this is very easy to do, doesn’t require a lot of planning, and will create a great memory. You will feel like you’re alone in the ocean, which is a great feeling. While all of the other tours listed below are great and you may see a lot more, they will be crowded – keep that in mind. Trips to the Isla Catalina or the Isla Saona are popular locations for snorkeling in Punta Cana and most resorts either have organized tours going there or have tour operators in-house that do. The trip is about an hour to an hour and a half away, so plan this as a day excursion. Both have great reefs and a beautiful beach. There is a lot to see at Isla Saona, villages, an inland swimming hole (this is a great sight-seeing trip as well). These trips will usually run you around $75 because of the transportation, but they tend to offer drinks and lunch. This is something that you should do at least once. The Marinarium in Punta Cana is an open-water aquarium featuring nurse sharks and sting rays. The tour starts with a bus-ride to Cabeza del Toro where you’ll board a platform boat that takes you out to the marinarium. Their security instructors will tell you everything you need to know and supply you with equipment. 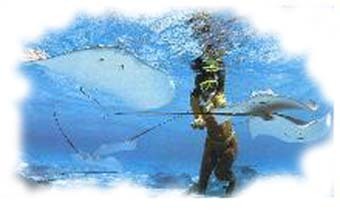 Then you’ll be off snorkeling with sharks and the rays – a very neat feeling. Make sure you bring a camera, you’re going to want a picture of this. Don’t worry, these are nurse sharks and while they are very scary looking they are not aggressive. This is a half-day trip that costs approximately $70 for adults and $35 for kids. resorts do have junior equipment (a limited amount) but kids faces are all different sizes and it tends to be difficult to find something that fits. You’ll spend most of your time adjusting your child’s mask. If you intend to snorkel, bring equipment for your child. Kid’s stuff isn’t very expensive and they will get good use out of it – they can have fun practicing in the pool and on the beach. remember to bring left-over bread from breakfast with you – the fish love it!